I felt like I was as prepared as I could be. Or so I thought. 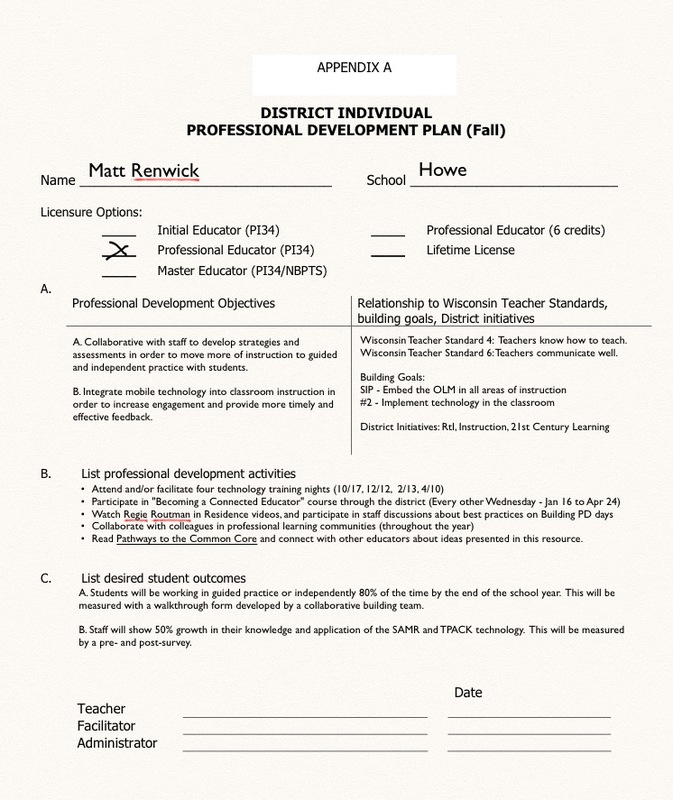 I shared visual samples of what the Individual Professional Development Plan could look like. An example of a SMART goal was distributed as well as presented on the whiteboard. We confirmed the due date for these goals to be submitted to me (within a month). As one might guess, the problem I ran into was changing too much at one time. I threw two new things at them today: 1) Connect your individual goals to a team goal, and 2) Do it in the context of a professional learning community. Expecting staff to make two shifts at one time is not realistic, especially when we have state assessments and other initiatives breathing down our backs. If I think back to my days as a teacher, I knew not to differentiate more than one piece of my instruction. Otherwise I would potentially lose my students due to too many choices and lack of focus (Content + Process = Product). For example, I could differentiate the process I used to present the content through visual, auditory and kinesthetic means, but that meant my content and product needed to stay the same. So why didn’t I follow what I knew to be best instruction? Maybe I am also feeling the pressure of getting information delivered without a lot of time and resources. Nevertheless, as I came back from our staff gathering I reflected on how it could have been better. I touched base with a few teachers and asked, “What are your thoughts after today?” The general consensus was that it was good information and they understood what is expected of them. It was just a matter of finding time to look over all the materials. I appreciate that my staff is so honest with me. It shows that we have a good level of trust, that they know I am looking out for their best interests and vice versa. Around the same time, the former principal at my school stopped by to drop off some documents. Always willing to lend an ear, he listened to my concerns about all this information being delivered to staff without enough time to truly integrate it with integrity. His response: Give them more time. Brilliant! And why didn’t I think of that? Maybe because I was too mired in the conflict itself and needed another perspective. At any rate, I developed a plan that extended the due dates as well as bring in subs to give grade level teams substantial time to collaborate. When I sent out the new plan, staff responded immediately with “Thank you!” and “I appreciate you understanding”. The fact that my teachers didn’t say much until I asked them speaks volumes about their character and their willingness to follow their principal into new territory despite their uncertainties. I think any public educator can make the claim that we are being inundated with initiatives like we have never seen before. I don’t believe this to be hyberbole; has their ever been a time before the present when standards (CCSS), teacher evaluations (value-added) and instruction (RtI) are all being overhauled at the same time? We as leaders need to recognize this, for our staff and ourselves, before leading change. All of these initiatives are truly secondary to the energy and well-being of the educators who work with our students every day. In spite of whatever comes our way, we need to build in time to breathe so we don’t become overwhelmed or forget why we entered this profession in the first place. 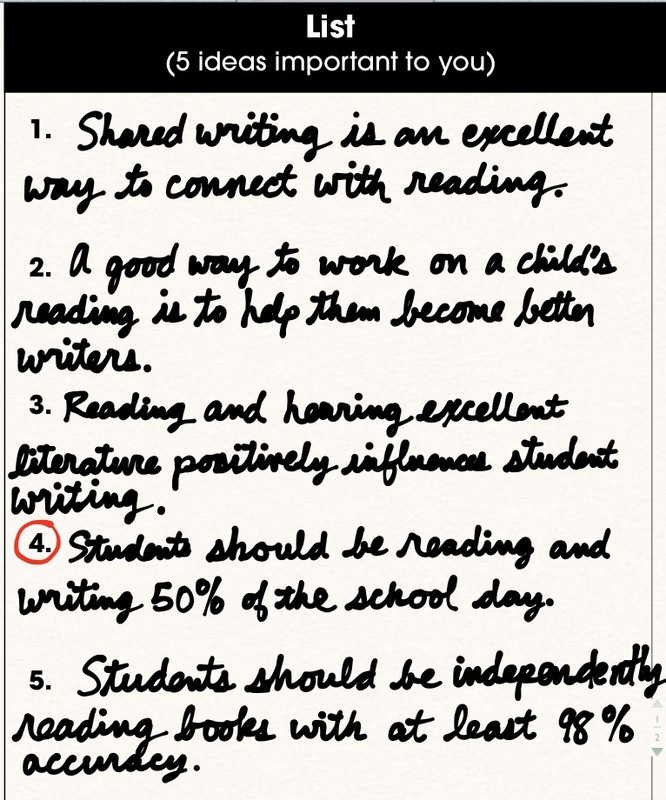 We expect students to write every day at school. As teachers we scaffold this process, by helping them come up with ideas, get those ideas down right away, organize their thoughts in a way that makes sense to them and others, and then start to compose a piece of writing that effectively communicates these ideas to an authentic audience. 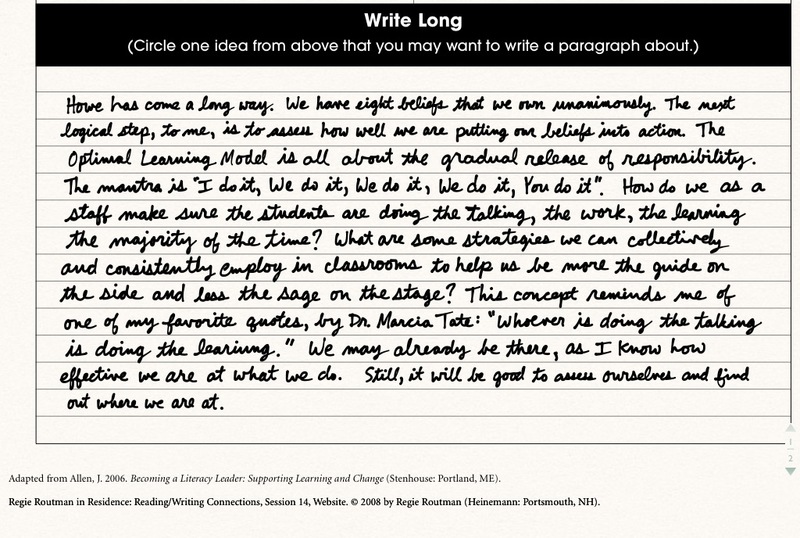 As a staff, we have an expectation that we write every day, too. Our intended audience is our students. Our purpose is to develop writers in our classroom by modeling this process, then gradually releasing the writing responsibility over to our students. At the same time, I have encouraged my staff to write for themselves. They could blog and share their great teaching ideas and connect with other educators, or just journal after a day of instruction to reflect on what went well and what to work on for next time. The audience for this type of writing are colleagues and/or themselves. With the new Educator Effectiveness Initiative in Wisconsin, also known as Act 166, all educators will be expected to write a little bit more. The audience? Their immediate supervisor. Starting in 2014, teachers and principals will no longer be evaluated once every three years. Superintendents and principals will now be observing schools and classrooms several times annually. What is replacing the long narrative evaluation tool are several pieces of evidence over a three year period. These artifacts can include walkthrough forms, checklists, video observations, peer coaching sessions, and documented informal conversations. Although this is another thing coming at public educators in the midst of Common Core, Response to Intervention and Smarter Balanced Assessments, the concept of making several observations over a multi-year period of time instead of the one time dog and pony show should be a welcomed change. The writing part for staff comes when they are asked to curate and reflect on their pieces of evidence that has helped them meet their professional goals. I am all for giving my staff information ahead of time. Not too much that they are overwhelmed; just enough periodically so they have an awareness of what is coming. The process we are using this year to start becoming more reflective practitioners by 2014 is a tool Regie Routman encourages for goal setting: List, Jot, Write Long. It is adapted from an activity developed by Jennifer Allen in her educational resource Becoming a Literacy Leader. Always trying to model the teaching process in my own communications with staff, I have taken part in this activity myself. The first of three steps is to list five ideas important to you. I chose to highlight three of our school’s shared beliefs about literacy, along with two recommendations from Richard Allington. 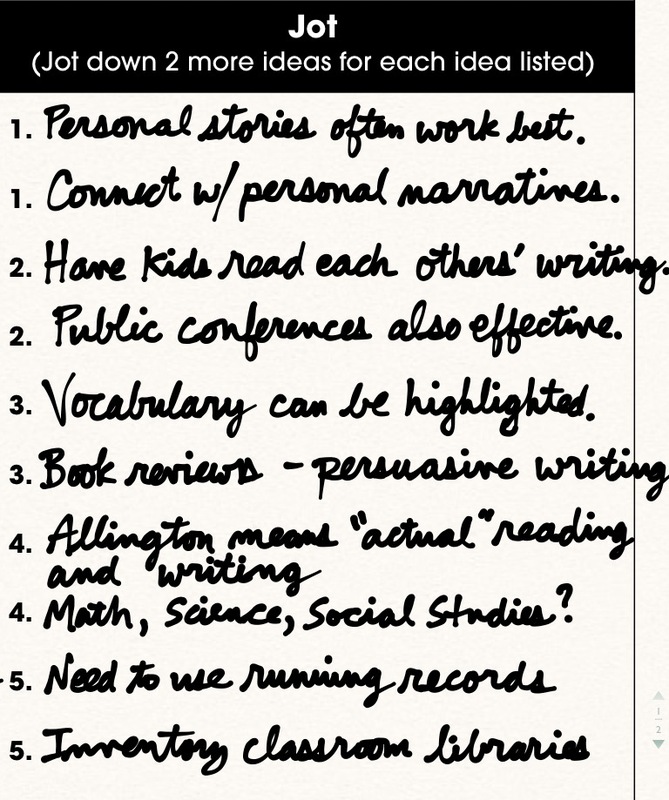 I circled one of these ideas (#4) to write more about later. After listing my initial thoughts, I jotted two more ideas from each main idea. I think the concept is to help flesh out my initial thinking and develop details for the last step. This is the end product, the culmination of a prewriting activity to help develop individual and team goals. As you can see, it is very reflective: I probably ask more questions than answer. That is okay, because this process is designed to help me discover what I want to focus on as a learner for the school year. With my beliefs and aspirations made visible, I feel like I am in a better position to set some goals for the school year, for my students and for myself. Using building objectives and district initiatives, I wrote my own goals as a staff member in my building. One goal is student-specific; the other encompasses the entire school, from more of the principal perspective. This process of starting with a simple writing activity and slowly progressing toward a final product has been helpful. Going from an initial idea (“Students should be reading and writing 50% of the school day.”) to a comprehensive objective along with strategies and assessments was made much easier because I started with our beliefs of practice and worked up. If you think this activity is the type of learning that could work for your building, I highly recommend Jennifer Allen’s resource and Regie Routman’s professional development series. Have you done something similar in your building? How could an activity like this be used with the students in your school? Please share in the comments. 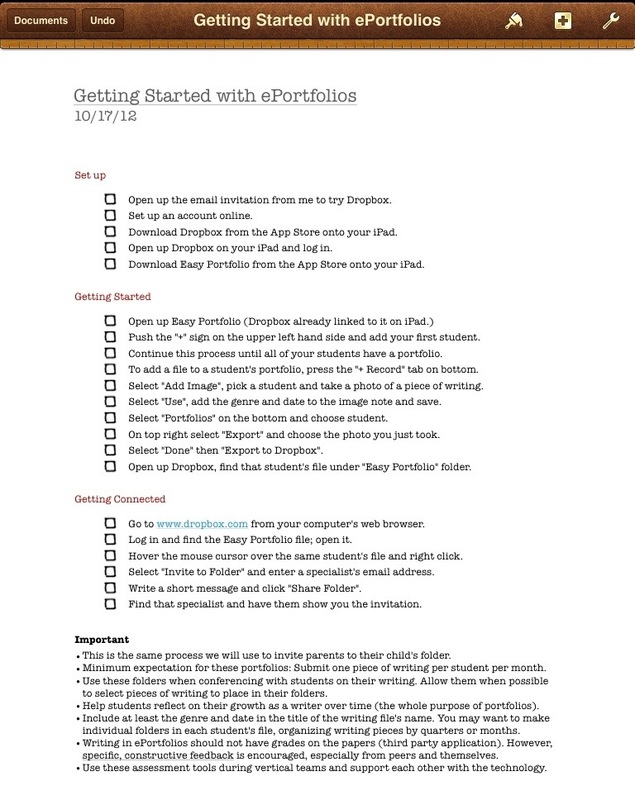 In a recent post, I laid out my school’s long-term plan for implementing ePortfolios. Portfolios in my district have been more of a chore for teachers, instead of a powerful tool for reflection and to show growth over time. Even when I was teaching, it seemed like a hoop we had to jump through. There are a variety of reasons for this: Lack of professional development for staff, no easy way to periodically share student work with parents, and (seemingly) never enough time during the school day. Our hope is that technology and time to collaborate will help change this for the better. 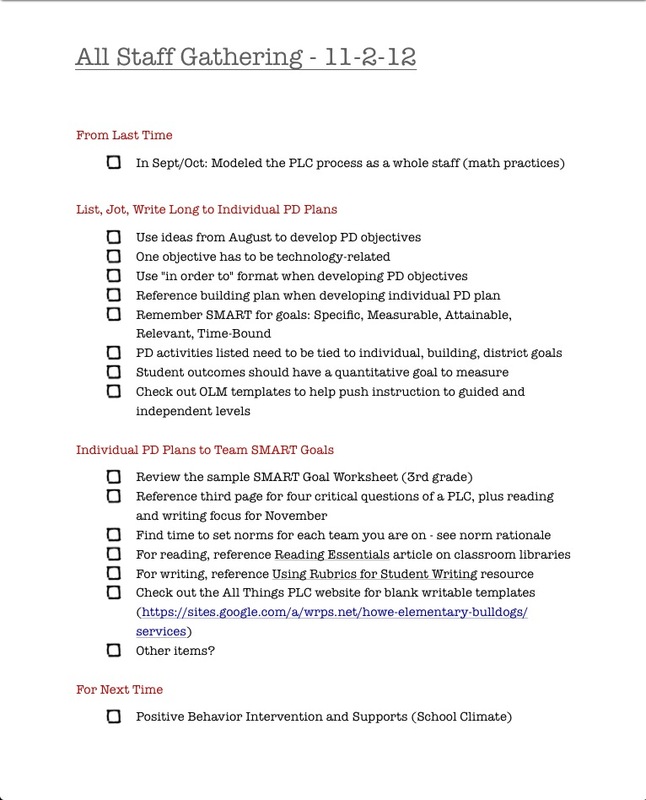 The screenshot below is a draft of my agenda for my staff’s first technology training night. What is not listed in the agenda is the research, rationale and process to support student portfolios; it will be covered prior to using the technology. It is important that I allocate enough time during the training for staff to practice using the technology with colleagues. The goal is that they leave our session with not only the what and the how but also the why we use ePortfolios. We will continue learning together during future technology nights this school year. Have I covered everything? Are my instructions clear enough that all staff will be successful? If you have any suggestions or feedback for us, please share with a comment. I recently flipped my staff professional development. This change was born out of necessity more than anything. The concept of flipping instruction has been used a lot in education, for both students and staff. My elementary school decided to try it because we didn’t have enough time during the day to truly learn with one another. In the past, we spend the majority of our limited time together watching a video or reading an article with little time to discuss what we saw or read. At the same time, it was recommended at a summer leadership institute that teachers spend 20-100 hours per year reflecting on their own practices, collaborating with colleagues and discovering better ways to help students learn. Something had to give. 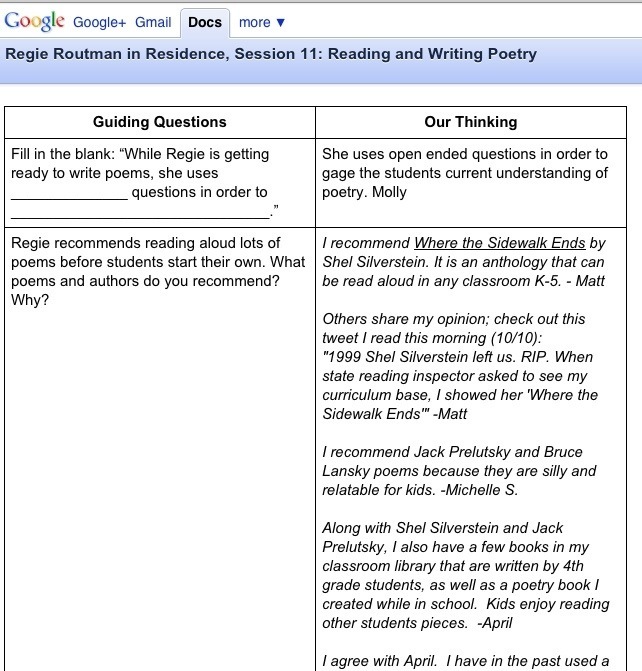 In late August, I asked my teachers to view online videos about teaching poetry from the Reading-Writing Connection. I also handed out the ASCD article Every Child, Every Day by Richard Allington. The expectation was they would complete these activities by our October 12 PD day. 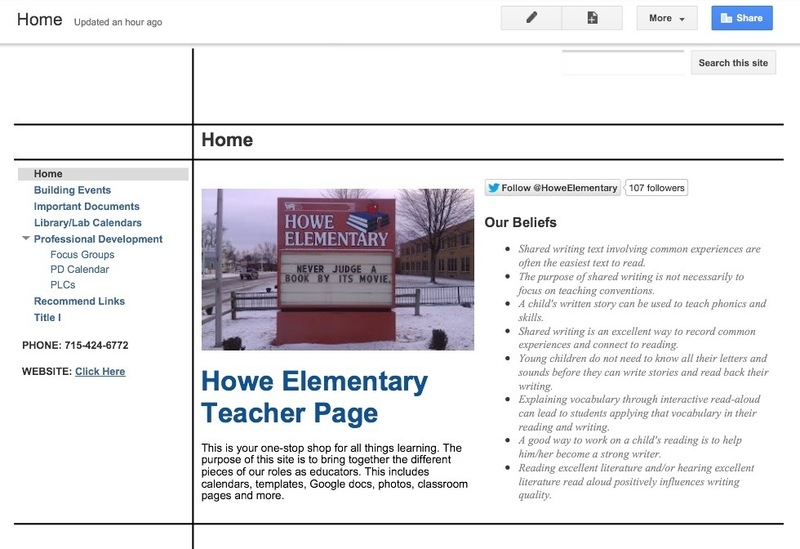 As the date drew closer, I shared a Google Doc to help guide teachers’ thinking as they watched the videos. Creating a two-column document, I wrote higher level thinking questions on the left side related to the videos, such as, “What does the concept ‘Whole-Part-Whole’ mean to you as a teacher?” On the right side staff wrote their responses to these questions. We also took stock of where our beliefs were as a staff. Instead of sitting down, filling out the surveys together and then tabulating them by hand, we used Google Forms and submitted our beliefs before we ever got together. Because much of the sitting and getting was done when it was convenient for each teacher, the majority of our time was spent talking with colleagues and sharing best practices. Not to say there wasn’t structure; there was. For example, we used the Last Word Protocol instructional strategy to facilitate discussion about Allington’s article. It gave myself and the other teacher facilitators an opportunity to model some effective instructional practices, an area that tends to take a backseat when curriculum and assessment directives are handed down to buildings. Each session was connected to our building goals, which are connected to our district and state initiatives. To keep things fresh, we made sure that no session lasted longer than 45 minutes. I wouldn’t expect kids to sit through an hour and a half presentation, and I can’t imagine my teachers would want to do the same. With the help of technology, our learning from today has not ended. 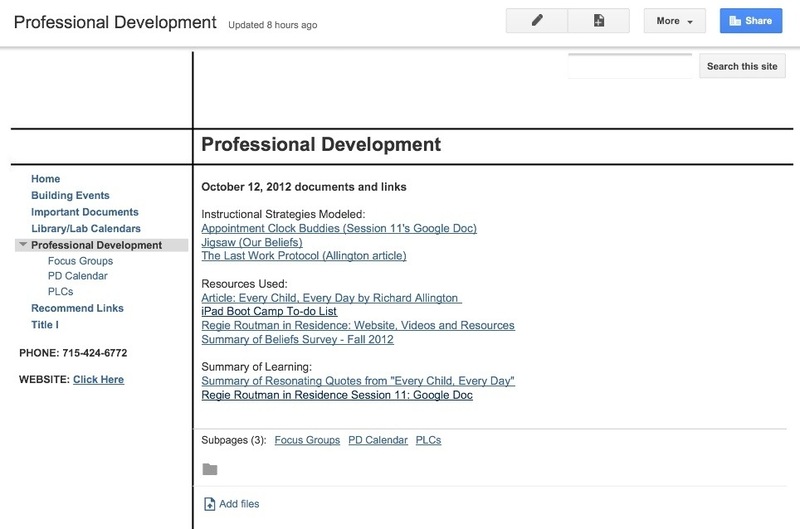 Many of the documents, resources and learning summaries were uploaded to our faculty Google Site for later perusal. This web tool has quickly become a hub for all of our important information. Our professional development day transitioned from these activities to self-directed, focused collaboration. I spent my afternoon working with teacher teams and addressing technology questions. When I tweeted out that I flipped my school’s PD, I got multiple replies asking how it went. Thinking back to one teacher’s comment (“I had so much fun today!”), I think things went very well.